Statement: "Margaretta K. Mitchell is a nationally-known artist and professional photographer, author, and educator based in the San Francisco Bay Area. She holds a Bachelor's degree in Art History and Fine Art from Smith College, as well as a Master's degree in Visual Studies in Photography from UC Berkeley." Berkeley, California: Elysian Editions, 2018. Edition of 10. 6 x 4.5"; 84 pages. Digital printing. Photography and text by Margaretta K. Mitchell. Binding by Virginia Phelps. Colors available for purse binding: black, gold, or silver. Printing by Irene Imfeld. Margaretta K. Mitchell: "The purse binding was created and made by Virginia Phelps, a book artist living in the San Francisco Bay Area. A chance meeting between Virginia and Margaretta Mitchell at the Antiquarian Book Festival was the beginning of a creative collaboration. When Virginia mentioned having made a book in the form of a loaf of bread, Margaretta immediately replied that she wanted to make a book of images in a purse-like form. Fast forward ... the results are 'On the Avenue'. "'On the Avenue' is a little book that lifts the spirits, bringing a smile to the lover of Manhattan's Fifth Avenue on a beautiful spring day, Easter Sunday 2006. Everyone is out on the street and in Central Park displaying themselves for my camera, my new digital 'point and shoot'! "I was led into the new world of digital imaging. … I found myself pointing the camera in all directions. … I let my eye roam, grabbing whatever was visible on the Avenue … I became obsessed with the crazy accessories we Americans carry. (It happened to be the year of the first big ugly, fancy bags.) The Big Purse and the spike heels, the babies, the shopping bags, the girlfriend, the boyfriend, the cellphone, the ice cream cone: everything I saw turned into accessories!" "The images celebrate the variety of images possible with the then new technology of digital cameras. 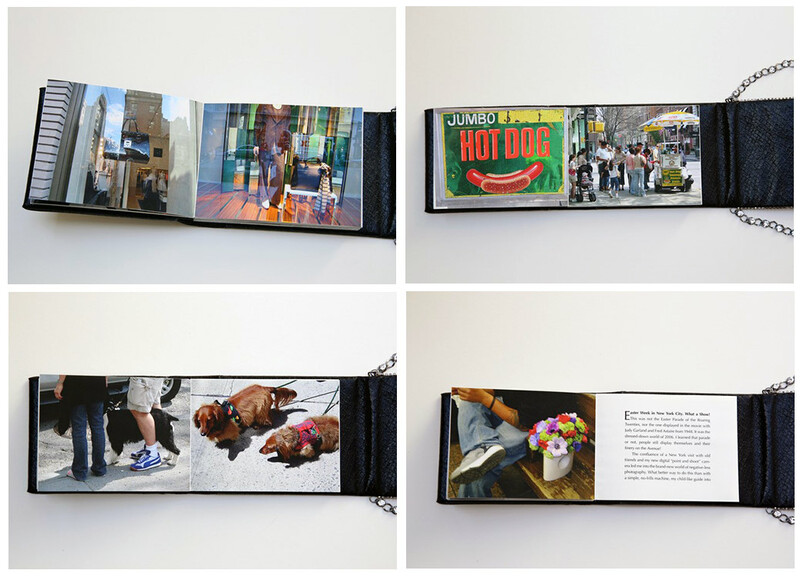 This unique book is an art piece disguised as a miniature movie bound into a purse. … fancy as the ones in the storefronts of Fifth Avenue found inside the pages of the book!"